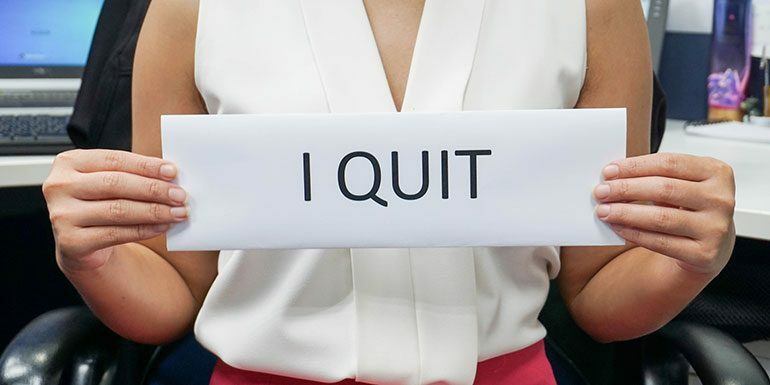 Do you plan to leave your current job? Awesome. According to me, it is one of the best decision irrespective of you willing to quit the job and become self-employed or want to move to a new position. So if you are looking to generate a professional resignation letter, my article will help you for sure. I always believe leaving something on a positive note is better. It helps in maintaining the relationship. One can ruin the relationship in minutes, but it has taken months and years to build it with the manager or the boss. Even if you don’t like him much, there is no point now in making it show in the resignation letter. And if you wish to quit doing a job and want to be a freelancer, here is the 6 step process I used to quit my job. So What is Resignation Letter Template? The resignation letter template is a template where an individual can copy and paste the main parts of the resignation letter to craft his or her resignation letter. Use this template for customizing personal info in the CAPITAL WORDS. Once the template edits are as per your needs, send it via email as well as in printed form and hand it over to your immediate manager, boss as well as to the HR department. One can also look up at the sample template below to get an idea of how should be the layout. What should be included and what not in a letter? Providing your employer with a notice period is mandatory. In India, the consensus for development jobs is to have 30 days of notice period before leaving the company completely. Again it can vary depending on your role, responsibility and terms and conditions as accepted by you at the time of joining the company. 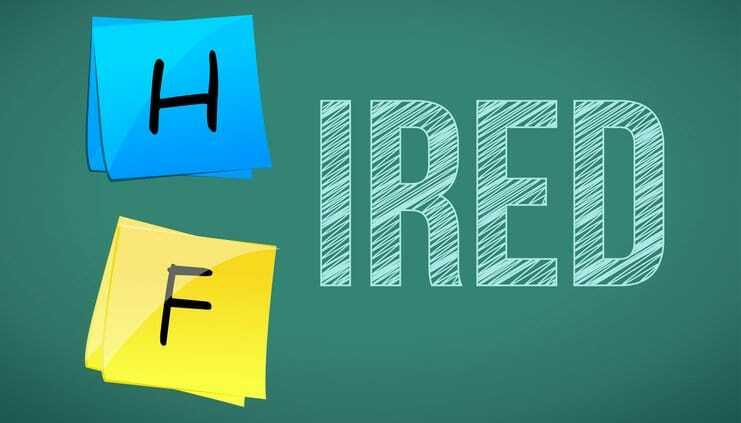 The notice period gives time for the employer to fill in your substitute and transfer the roles and responsibility. The said notice period might also serve as a time to reassign the task to someone else. Serving the notice period demonstrates professionalism and helps individual leave the job on a positive note. It also builds the confidence of the new employer when an employee joins after serving the notice period in the prior company. Let me point out some of the Do’s and Don’ts when you are leaving the current job. Use email as well as hard copy format. Be generous and humble, immaterial of your hatreds for the boss or the manager. Keep the resignation letter positive and try to leave the job on a positive note. Always try to offer help during the transition/notice period. Later when you are in a new position, be available to assist. In case you may need a reference in future jobs. Don’t brag about your new job. Neither in the resignation letter nor verbally. Don’t be straight but if you prefer, to be honest, be humble instead of being rude. Never leave the job without serving the notice period. The resignation letter isn’t for negative feedback or criticism. Everyone leaves for a reason but making the real reason known will not be of help much in your career. Don’t let others know about the resignation until it is being accepted by the manager or the boss. If you are a precious resource in the company, you may be offered a very lucrative package to remain. Let us now begin with the resignation letter template. Make sure the resignation letter is concise as well as include all the relevant information. Remember never mention details of the future job role or responsibility in the resignation letter. Even if in an exit interview, you are asked about the future job, you are free not to disclose the next employer. When I was working in Lexmark, I remember one of our colleagues resigned, and we all knew he would be joining IBM. Later when we met in a friends marriage, I knew he joined a different company. It was then he told us he never joined IBM and had a couple of offers at that time. So if you have to tell the name of the next employer, and don’t wish to disclose, use the option of having more than one offer. Just remember if you are to use more than one offer option, even the closest friend in the company should also know the same. 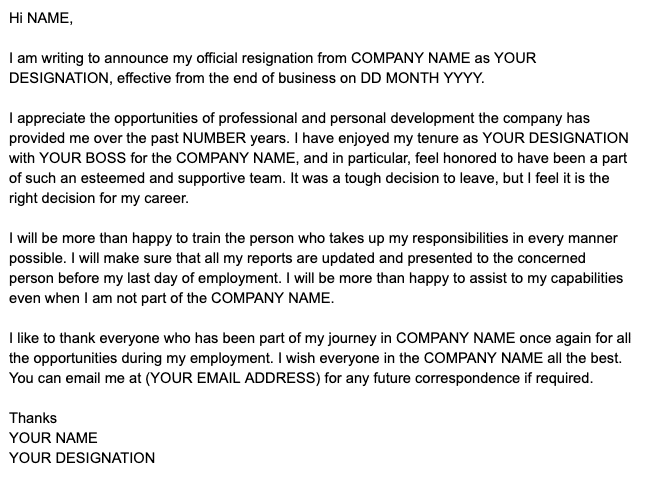 You can download the above Resignation Letter Template as Google Doc here. Let me explain the template in detail. The opening paragraph should tell everything. I am writing to announce my official resignation from COMPANY NAME as YOUR DESIGNATION, effective from the end of business on DD MONTH YYYY. Start the letter by introducing your name job title, address, and the company. Provide the date instead of using the word today. Though email has time, if you want to submit a printed version of the same to HR or other departments, it will help. The next couple of lines should be the paragraph of appreciation. I appreciate the opportunities of professional and personal development the company has provided me over the past NUMBER years. I have enjoyed my tenure as YOUR DESIGNATION with YOUR BOSS for the COMPANY NAME, and in particular, feel honored to have been a part of such an esteemed and supportive team. It was a tough decision to leave, but I feel it is the right decision for my career. Words of gratitude matter the most when leaving a job. State in your letter what you have been apprehending the most about the job role and the company. Talk about the professional development opportunities, the work environment, your subordinates including the senior team members. The company that has nurtured your career. If you are quitting doing the job entirely, include where you intend to do next like pursuing higher studies or starting a business. Again, if you are joining some other company, it is better to avoid. The next paragraph should be to offer assistance even after you have left the position. I will be more than happy to train the person who takes up my responsibilities in every manner possible. I will make sure that all my reports are updated and presented to the concerned person before my last day of employment. I will be more than happy to assist to my capabilities even when I am not part of the COMPANY NAME. Mention you are willing to help the new recruit with everything that comes under your control, as well as complete all pending work and reports before leaving the company. I like to thank everyone who has been part of my journey in COMPANY NAME once again for all the opportunities during my employment. I wish everyone in the COMPANY NAME all the best. You can email me at (YOUR EMAIL ADDRESS) for any future correspondence if required. It is helpful if your boss or manager truly wants to keep in touch with you. If you are in good terms with them, it can be a reference contact in the future.